Aurora_b's Web Diary - Still in Trini! We launched a day late, but we are now coming up to being a week late leaving. The main reason has been problems with the diesel generator we have on board. 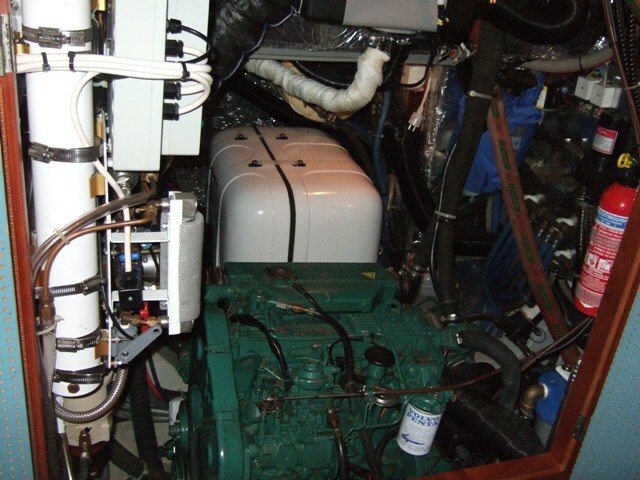 When it's running, when we're at sea or anchor, it gives us up to 6.5kW - for that we can simultaneously run the watermaker, the battery charger, the immersion heater in the hot water tank and still have plenty to spare. The most important use is the watermaker which makes 105 litres an hour. Our water tanks are large enough to go where we want to go without it, but we would have to ration water on the longer passages and would have to head for ports where we could refill the tanks. The watermaker allows us to cruise in more comfort - showers every day on long passages if we want them - and gives us much more freedom on where we go. We also don't have to worry about taking on dodgy water, which you do get from some ports. The first problem with the generator was trying to fix a fuel leak from one of the injector pipes. The spare injector pipe that we had brought from the UK turned out to be the wrong one. So we had to order another from the States which took a week. We actually ordered 2 via 2 different routes, the second one is still somewhere in the States (we think), tracking it down is no longer a priority. If it turns up we'll add it to our growing collection of spares! Having fixed the leak, we found we were making a great impression of the Flying Scotsman going uphill! Steam was billowing out of the exhaust - this did not look good! After much investigation, phone calls to Holland (where the generator was made), and collecting exhaust water in a bucket to check the flow rate, we were told to check one of the sea water cooling hoses as they had had 3 other cases where the hose had delaminated on the inside, blocking the flow. We did the check and the hose, which looked perfectly okay on the outside, was 90% closed. We then checked the other sea water hoses and they were all affected. It's a wonder that any water found it's way through! The makers put it down to a faulty batch of hoses. Having changed all the sea water hoses we are no longer making steam and we finally put the sound insulation covers back on the generator today. 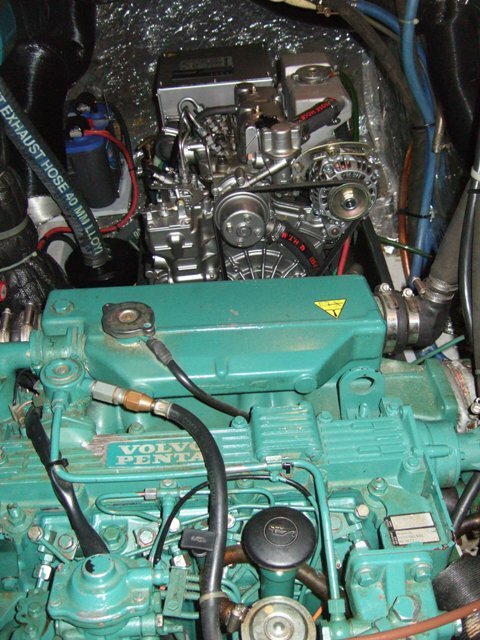 The generator is over the far side of the engine compartment and so leaning over the main engine to work on the generator engine I have a good impression of a Volvo heat exchanger on my chest! The generator, which we're getting to know quite well! Main engine (my cushion!) + generator behind it. 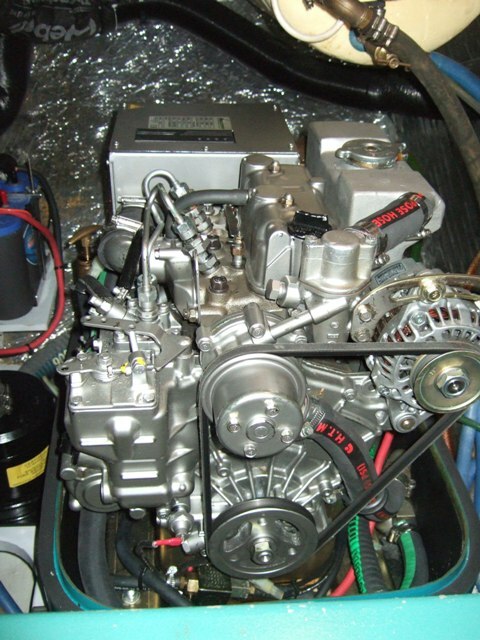 The engine compartment - fairly well packed. The generator's white capsule covers are finally back on! The white tubes and pipes on the left are the watermaker. So now it's completing a few other jobs, including servicing winches and the windlass, putting things away and preparing the boat for sailing once again. The weather is not playing ball though - the dry season officially started on 1st December, but we have had more rain since then than we had in the previous 2 months. It's rained every day since the 1st, with prolonged rain on many days, so outside jobs that need dry conditions have had to wait. We're hoping for better conditions next week and if we get them we hope to be on our way again before next weekend. If we don't, it could be Christmas in Trinidad. There are a lot of yachts still here and quite a few are not leaving until after Christmas, so we will have plenty of company if we are still here. We're currently listening to Radio 100 - they play Christmas tunes 24 hours a day for the 100 days before Christmas - so it's been Christmas since September 25th! The new shopping malls are all decorated just like home - with imitation snow! (It might be wet, but it's still hot.) We've also been getting in the mood by going to a Christmas choral concert in the main concert hall in Port of Spain and are going to hear parang (Christmas music) and steel pan in POS tonight. We still can't believe it's Christmas in less than 2 weeks, the time has just flown by.